The Kiki McDonough Grace collectioncrafted of gems surrounded by brilliant white diamondsfeatures refined pieces. 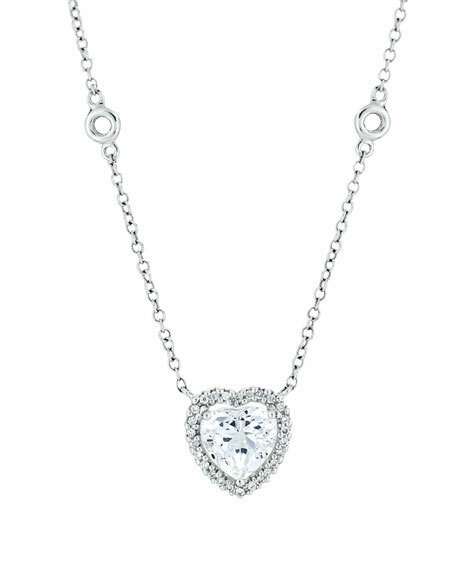 This diamond-detailed heart necklace will transition from day to night beautifully. Topaz, 1.66 total carat weight. Diamond, 0.07 total carat weight. Long wrap necklace by Brunello Cucinelli. Assorted wooden and hematite beads. Designed to wrap around multiple times. Made in Italy. Long wrap necklace by Brunello Cucinelli. Assorted wooden and hematite beads. Designed to wrap around multiple times. Made in Italy. Model's measurements: Height 5'11"/180cm, bust 32"/81cm, waist 24"/61cm, hips 35"/89cm, dress size US 2. Brunello Cucinelli necklace in brown hematite with diamanti disc. Multi strand design. Made in Italy. Model's measurements: Height 5'11"/180cm, bust 32"/81cm, waist 24"/61cm, hips 35"/89cm, dress size US 2. Brunello Cucinelli silver stone variegated choker. Long monili drop. Made in Italy. Model's measurements: Height 5'10.5"/179cm, bust 32"/82cm, waist 23.5"/60cm, hips 34.5"/88cm, dress size US 2.